A portable garage canopy is often referred to as a carport that shelters your car from bad weather. Not every car owner will have their own garage but a heavy duty carport can be just as good with the advantage of being portable. The best carport canopy is the Abba Patio 12 x 20-Feet Heavy Duty Carport with detachable sidewalls. It is made from high quality durable polyethylene that can withstand bad weather such as wind, torrential rain and snow. There are two main different choices of carports from polyethylene to steel constructions, with the latter being stronger but much more expensive. The great thing about having a popup carport gazebo is that they are portable and can be taken anywhere you like. If you are an avid car show goer, you will notice many carports at stands or around high end vehicles. The steel construction carports are not so portable and usually remain fixed to the ground with bolts. The benefit of steel is that it can withstand much more punishment than and polyethylene alternative. Working on your car without proper shelter can be a real pain if the weather turns bad. A carport ensures your car stays dry and even adds security so that no eyes can see your pride and joy. Below is a list of the best carport canopies that are heavy duty to withstand bad weather. The Abba Patio brand are known for creating gazebos for a range of uses from party marquees to vehicle carports. This 12 x 20 feet polyethylene canopy is built with rust resistant steel metal and heavy duty polyethylene to protect your car. In order to provide additional protection during bad weather, this carport has detachable sidewalls, which can easily be removed. During the hot summer season, removing these sidewalls will provide additional air flow to keep the car cool. The Abba Patio car gazebo uses heavy duty bungees to secure the tarp cover to the steel frame construction, which is really quick to remove if you are taking the carport down. You will easily be able to put this carport together on your own in a short amount of time. Not many polyethylene car shelters can withstand bad weather but this one can. Abba Patio state that it will be able to handle wind, rain and snow with ease, which is great for protecting your pride and joy. Overall it is the best portable carport canopy you can buy with use of durable materials and the ease of setting it up. It is a heavy duty carport made from polyethylene that will not let you down. The premium Palram Victoria carport is constructed of heavy duty aluminium and galvanized steel, which is available in a range of sizes including (16 x 10 x 7, 16 x 10 x 8 and 16 x 12 x 8). There is also the choice of an arched or flat roof. The polycarbonate panels on the roof are shatter resistant and provide 100% UV protection to prevent them going yellow as well as protecting the car. Once installed, they are maintenance free because they are made of rust resistant materials that are then powder coated. Installing the carport is very simple too with no special tools required. To top things off it also comes with 10 years limited warranty to see you over many years of bad weather conditions. The perfect use for this carport is if you live near many trees where debris can fall leaving your car dirty or even damaged. Anything that falls will simply bounce from the roof and roll down to the side. Of course, you have the standard benefits from ensuring your car is kept dry and not covered in snow. The Palram Vitoria Steel Carport is stylish and has superior build quality compared to many cheaper alternatives. It is the best carport made from an aluminum/steel construction that is built to last with a relatively easy installation. The Ikuby carport is a lockable car shelter that covers the whole of the vehicle for full protection. It is a very clever design that can withstand all bad weather by using a durable 600 D Oxford fabric. The 600 D Oxford fabric is durable and heavy duty to the point it can protect the car against hail stones, snow, torrential rain and more. The frame itself is made from steel where each piece is numbered to make the installation simpler. The Ikuby is a sturdy carport with a gross weight of 170 pounds and would make both a excellent portable garage or semi permanent garage. The unique design gets everyone curious and the protection against the car is right up there with the best. 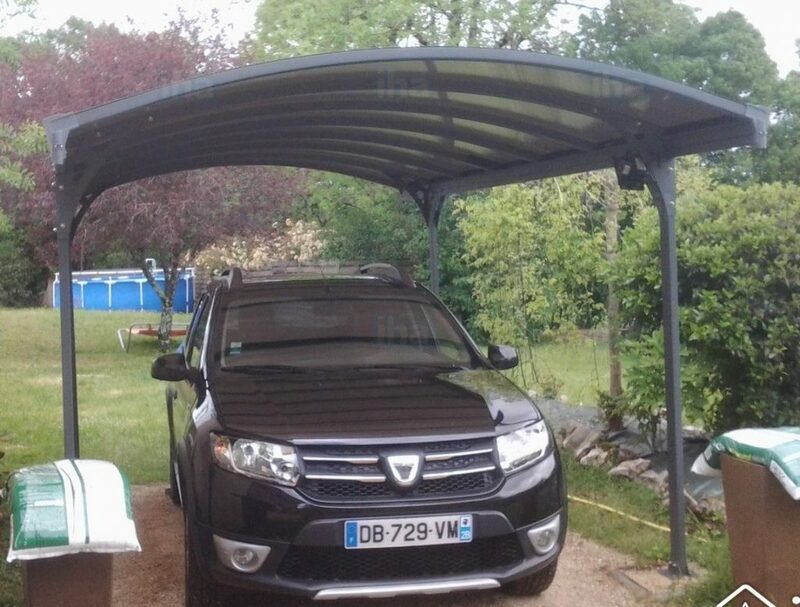 If you are looking for something quite special and unique in terms of carports, this Ikuby carport that is also lockable is an excellent choice. Not every car owner will have the money to splash out on a premium carport but there are cheaper alternative. Abba Patio have a budget carport that is very popular among the car enthusiasts community, which is also available in two different colors. The frame is made from 1-1/2 inch powder coated steel with the outer layer being double polyethylene fabric. This combination is the basic formula to the perfect simple car shelter to help protect your car from rain, wind and snow. It is available with the dimension of 10 x 20 feet that will be capable of protecting the majority of cars. There are 6 legs to the car port with foot pads for each to increase the stability with heavy duty bungee cords securing the tarp cover tight. Overall, this is the best cheap carport canopy for the money and will provide great protection for your car. Many cheaper examples cannot handle bad weather such as snow and have a tendency of blowing over in heavy wind. The 90154 ShelterLogic is a large carport that is heavy duty in regards to the steel frame and fabric. In terms of dimensions, it is 12 x 24 x 11 feet, which is great for those taller vehicles such as trucks or RV’s. All of the steel used within this carport canopy are powder coated and resist any form of corrosion. The polyethylene woven fabric is commercial grade quality that is UV treated inside out. The foot plates are designed to be solid and stable on the ground as well as being easy to setup. To increase stability, ShelterLock have their very own patented stabilizer block at every rib connection to increase the strength of the carport. It really is a heavy duty carport that will fight off every type of weather with ease. Overall the ShelterLogic 90154 is the best large carport canopy you can buy. The additional size makes it perfect for large vehicles but also more room to work/service cars from inside if this is something you wish to carry out. The two main types of carports are polyethylene and aluminum/steel, which both will protect your car. However, the latter will clearly protect your car more because it will not move under a heavy attack such as a tree falling down. You are probably looking for a carport because you do not have a garage available at your home. Deciding between the two different types is purely dependent upon your budget and whether you want it to be portable or not. However, you should be aware of the factors to consider before making the purchase. The cheaper and more portable polyethylene car shelters are very popular worldwide. They provide the all important protection from rain, wind and snow for your vehicle at a budget price. The ability to take a carport down in seconds when its no longer needed is the main benefit. Due to the materials used, the heavy duty steel and aluminum carports are much more expensive. However, with this additional cost, you get a strong carport that will withstand excessive damage and they are actually a necessity if you live in a wooded area. If a heavy branch from a tree fell onto a polyethylene carport, it would more than likely crash straight through and damage the car but this would not be the case with a metal construction. To the average “handyman” a carport installation is a piece of cake as there is not that much to it. The majority are polyethylene carports have a steel frame with the fabric using bungee cords to remain secure. Steel or aluminum carports will be more heavy duty but still require no special tools. Both can setup on your own or two people to make it easier. Many people like to go further and install bright garage lights to the port to provide lighting when underneath. In terms of the dimensions of the carports available, the standard length is usually 20 feet long by 10/12 feet wide. The height really does vary but if you have a lifted truck or RV, its really important to check the height dimensions. The length is usually more than plenty for the majority of cars. For those that work on their cars, there will be plenty of space for using a car ramp for servicing or taking the wheels off your car whilst remaining dry.